In a carbon copy of yesterday's early session, global stocks and US equity futures rallied amid renewed optimism of a thawing in U.S.-China trade relations after President Trump said he would intervene in Huawei case to get a trade deal with China and was ready to meet with Xi for a second time. The question now is whether the early rally will once again fizzle as it did 24 hours ago. 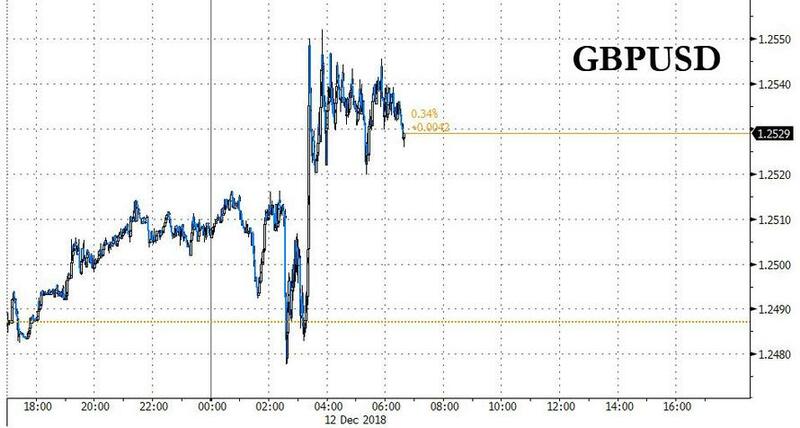 The pound strengthened as traders took news that Theresa May will face a vote of confidence from the Conservative Party she leads in stride, with sterling gaining as several ministers rushed to back her and she vowed to contest the vote “with everything I’ve got", prompting analysts to conclude she may prevail. Global markets were solidly in the green, with Asian and European shares enjoying big gains after Trump said talks were taking place with Beijing by phone and he would not raise tariffs on Chinese imports until he was sure about a deal. Trump also said he would intervene in the Justice Department’s case against a top executive at China’s Huawei Technologies if it would serve national security interests or help close a trade deal, after a Canadian court on Tuesday granted bail to the executive in a move that could help placate Chinese officials angered by her arrest. 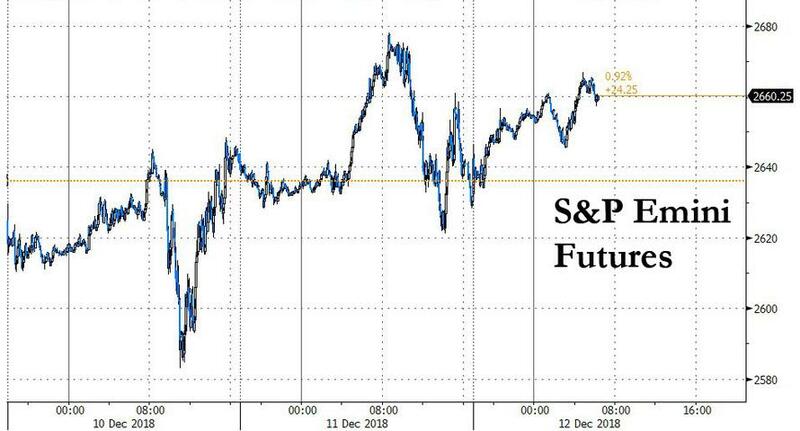 S&P futures were 0.7% higher in a rerun of Tuesday's morning session, buoyed by more Trump rhetoric after the president told Reuters that it would be a mistake if the Federal Reserve raises interest rates when it meets next week, as it is expected to do, continuing his criticism of the U.S. central bank. “I think that would be foolish, but what can I say?” Trump told Reuters in an interview. Trump said he needed the flexibility of lower interest rates to support the broader U.S. economy as he fights a growing trade battle against China, and potentially other countries. “You have to understand, we’re fighting some trade battles and we’re winning. But I need accommodation too,” he said. In Asia, Japan’s Nikkei led the way in Asia with a jump of 2.2% while Shanghai blue chips rose a more modest 0.3%. London, Frankfurt and Paris then gained between 0.4 and 0.8 percent to push Europe higher. Of course, having been repeatedly disappointed before, analysts were still being careful to not get too optimistic about prospects of a trade agreement. ING said the Huawei case made it increasingly obvious that the China-US trade war is about the exchange of technology, and there were also reports the United States would release evidence this week detailing Chinese hacking and economic espionage. “Even if this (auto) step is taken it just removes what was a retaliatory measure to begin with,” noted ANZ economist David Plank. “Whatever the case, market price action is somewhat of a chop-fest, right now, as it swings around on each new headline." On Tuesday, markets had also been jolted when Trump threatened to shut down the government over funding for a wall he has promised to build on the southern border with Mexico; look for more drama out of the White House. Meanwhile the Brexit drama may be approaching an endgame of sorts, when as noted above, the pound fell to 20-month lows overnight after lawmakers in May’s Conservative party gathered enough support to trigger a no-confidence vote in her leadership. But it stabilized as some investors bet that May would win Wednesday’s vote and in the process isolate opponents in her party who want a clean, sudden break from the EU. Nevertheless, uncertainty over the secret ballot capped gains, keeping the pound only just above $1.25, having shed 1.9 percent in the previous two sessions to a trough of $1.2483. The vote of no-confidence will be held between 18.00GMT and 20.00GMT tonight, with results are to be announced at 21.00GMT. UK PM May said a new leader would have to extend or rescind Article 50, while adding she believes a deal with EU is attainable and within UK’s grasp after meeting with EU leaders yesterday. Chairman of 1922 committee Brady says that if a leadership contest were to occur, they would want to finish the parliamentary stage before Christmas. Meanwhile, ITV's Peston tweeted that MP George Freeman appears to be saying that PM May is over, but that Tories have to find a way to replace her temporarily without a leadership election. Elsewhere, UK Shadow Brexit Minister Starmer said the opposition Labour party will call a no-confidence vote “before Christmas”. “The market is concerned that May could be replaced by a Brexit-supporter, increasing the chance of a no-deal scenario,” said Rodrigo Catril, a senior FX strategist at NAB. The dollar weakened versus most of its G-10 peers, as the yen slipped as demand for havens waned on signs the U.S.-China trade dispute may be easing. The recent slide in U.S. yields means that the prospect for “broad- based” yen appreciation appears to be increasing every day, Morgan Stanley strategists wrote in a note. The Aussie rose a second day as the offshore yuan climbed with Asian and European equities and U.S. stock futures. Investors are also looking ahead to the U.S CPI later on Wednesday where an expected slowdown in headline inflation would only reinforce speculation of fewer rate hikes from the Federal Reserve. Meanwhile, in France, the spread between government bond yields and those in Germany were about the highest since the 2017 election. France’s Prime Minister Edouard Philippe confirmed that President Emmanuel Macron’s efforts to meet protester demands will have an impact on the country’s deficit, with the situation causing a new headache for the EU in its talks over the Italian budget. Elsewhere, oil jumped on the easing trade war rhetoric and after the API oil report signaled a far greater than expected, 10 million draw in crude inventories. Treasuries edged lower after Trump warned the Federal Reserve against hiking interest rates this month. India’s bonds rallied after an ally of Prime Minister Narendra Modi was named as the new central bank chief. In terms of metals, spot gold (+0.1%) remains steady as the dollar index remains within a tight range while copper traded sideways near weekly highs in light of the improvement in risk sentiment. Elsewhere, Shanghai steel snapped a three-day losing streak amid talks of production cuts at the top steelmaking city, Tangshan. Sovereign bonds and stocks rallied in India on optimism of a more dovish monetary policy after the government named former bureaucrat Shaktikanta Das as the central bank chief. The rupee weakened amid investor concerns about central bank independence. Asian stocks traded higher across the board with sentiment underpinned as news flow spurred optimism regarding US-China trade relations, including reports that China submitted a proposal for review that would cut tariffs on imports of US autos to 15% from 40%. ASX 200 (+1.4%) and Nikkei 225 (+2.2%) gained from the open with energy and tech the front-runners in Australia, while the Japanese benchmark outperformed as it benefitted from USD/JPY’s slipstream and with the BoJ said to have purchased a record JPY 6tln of ETFs so far this year. Elsewhere, Hang Seng (+1.6%) and Shanghai Comp. (+0.3%) were positive on hopes of a potential tariff cut on US autos and encouraging comments from US President Trump, while news that Huawei’s CFO was released on bail and the recent better than expected lending data from China also added to the optimism. Finally, 10yr JGBs are subdued with demand dampened by the gains in stocks and amid spill-over weakness from T-notes. European equities are higher across the board (Euro Stoxx 50 +1.3%) following the strong performance experienced in Asia overnight after sentiment was underpinned as news flow spurred optimism regarding a US-China trade deal. France’s CAC 40 (+1.6%) outperforms its peers on the back of shares in Kering (+2.0%) amid an upgrade at Deutsche Bank and Pernod Ricard (+3.6%) after upbeat comments from activist investor Elliott on the Co. Meanwhile, Spain’s IBEX 35 (+0.80%) marginally lags peers as the index is weighed on by shares in heavyweight Inditex (-4.0%) following disappointing earnings. Moving on, sectors are experiencing broad-based gains with marginal outperformance in utility names. In terms of notable movers, auto names are performing particularly well (Stoxx 600 Auto & Parts +1.5%) in a continuation of the positive momentum from potential Chinese tariffs cuts on US autos from 40% to 15%. Meanwhile, Dixons Carphone (-8.2%) shares fell in excess of 10% at one point after the company downgraded interim dividend guidance alongside expectations for higher net debt. In FX, GBP is not just the most volatile major, but displaying considerable resilience (or complacency?) in the face of perhaps the biggest Brexit hurdle in the form of a challenge to UK PM May’s leadership, not to mention all the political uncertainty if she fails to survive. However, Cable has recovered well from new ytd lows circa 1.2478 and almost reached 1.2550 before waning again as a number of high profile Cabinet members voiced public support for the current Conservative head in the run up to tonight’s confidence vote. A hefty 1 bn option expiry at the 1.2500 strike may be exerting a gravitational pull, while Eur/Gbp is pivoting 0.9950, as the single currency continues to weather its own storm via Italian and French budget excesses. EUR/AUD/CAD/CHF/JPY:All narrowly mixed vs a generally firmer Greenback (DXY just off a fresh 97.500 recent peak) and the ongoing revival in broad risk sentiment amidst heightened hopes of a tangible improvement in US-China trade relations. Eur/Usd has survived another, deeper test of 1.1300 support where a massive 2.4 bn expiries reside and are perhaps helping to keep the headline pair cushioned against Italian/French deficit issues ahead of Thursday’s ECB policy meeting. Meanwhile, the Aud and Loonie are feeding off the aforementioned improved risk appetite, with the former holding above 0.7200 and latter rebounding a bit further from 1.3400+ lows with the added incentive of rebounding crude prices. The Franc is meandering in a tight range between 0.9950-20 and encircling 1.1250 vs the Eur awaiting the final 2018 SNB Quarterly review tomorrow, while Usd/Jpy is equally restrained within 113.50-30 trading parameters with the topside said to be laden with Japanese offers. In commodities, WTI (+1.8%) and Brent (+1.7%) trade with firm gains amid the improvement in the risk sentiment as US-Sino trade discussion seem to be on track, with US President Trump expressing optimism via Twitter yesterday. Furthermore, prices may be underpinned in light of last night’s API crude inventories which showed a much wider-than-expected draw of 10.18mln barrels vs. the expected draw of 3.0mln barrels. Traders will be eyeing this afternoon’s weekly DoE inventory release for a fresh catalyst (alongside production numbers) in which crude inventories are expected to decrease by 3.0mln barrels. In terms of metals, spot gold (+0.1%) remains steady as the dollar index remains within a tight range while copper traded sideways near weekly highs in light of the improvement in risk sentiment. Elsewhere, Shanghai steel snapped a three-day losing streak amid talks of production cuts at the top steelmaking city, Tangshan. Looking at the day ahead, in the US it’s all eyes on the aforementioned November CPI report. Also due out is the November monthly budget statement. Away from all that we’re expecting to hear Italian PM Conte today when he speaks to Italy’s lower house of parliament. The European Parliament is also due to vote on the draft free-trade agreement between the US and Japan, German Chancellor Merkel answers questions from members of the Bundestag and the WTO general council two-day meeting begins. OPEC’s monthly oil market report is probably also worth a close watch. I’m in Paris for a couple of days where I last night nervously watched a make or break Liverpool game (make thankfully) in the Champions League in my hotel room. It was stressful enough but half way through the first half a member of the hotel staff knocked on the door and came in and said “turn down, turn down”. I said “sorry, sorry” and ushered him out of my room as it was too tense to have my eyes averted for long. I figured that because both my ears are blocked with infections I’d been watching it unintentionally loud and annoyed my neighbour. So I carried on watching it at low volume, barely able to hear the commentary or the atmosphere. It wasn’t until I went to bed after the match that I realised my bed had about 15 pillows on it and hadn’t been “turned down”. It then dawned on me that the guy wanted to do my bed and that because I’d misunderstood and tried to get rid of him ASAP, I’d ended up watching more than half the game at an inaudible volume. At least I think that’s why!! From vol(ume) to vol(altility) with yesterday seeing another notable swing in the US after Monday’s large intra-day recovery. Markets closed flatish but early strong momentum faded fast after a confrontational meeting in the White House between President Trump and congressional Democrats. The S&P 500 and NASDAQ opened up +1.37% and 1.56%, but fell around noon in New York (down just over -0.5% at the lows) and ultimately closed -0.04% and +0.16% respectively. The eventful meeting at the White House ended in acrimony, with both sides positioning ahead of an increasingly-likely shutdown when the federal budget lapses later this month. Such rancour does not look positive for the odds of economically-positive legislation next year, whether via infrastructure, further tax reform, or something else. 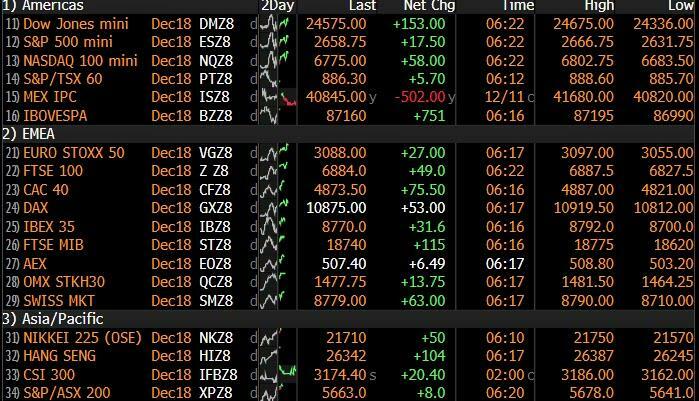 This morning in Asia markets are largely trading higher with the Nikkei (+2.02%), Hang Seng (+1.54%), Shanghai Comp (+0.20%) and Kospi (+1.33%) all up as US President Trump expressed optimism over the US-China trade talks in an overnight interview with Reuters. He said that China is buying a "tremendous amount" of US soybeans and trade discussions with Beijing are underway by telephone, with more meetings likely between US and Chinese officials while adding that he’s also willing to meet with China’s Xi Jinping again on trade if needed. Sentiment is also being aided to some extent by the overnight granting of bail to Huawei’s CFO by the Canadian court and President Trump’s suggesting, in the same interview with Reuters, that he might consider intervening in Huawei case if it would serve national security and help with a China trade deal. Elsewhere, futures on the S&P 500 are up +0.27% and the 2s10s treasury curve has flattened further to +10.8. In commodities, Chicago board Soybean futures are up +0.38%, back to the levels last seen in August. Earlier yesterday, European markets were playing catch up with the US from Monday, however broader sentiment was helped by the news that a proposal had been submitted to China’s Cabinet – which is to be reviewed over the next couple of days – to reduce tariffs on US made cars to 15% from 40% currently. It’s worth noting that the 40% tariff was a retaliatory move – so this is just a move back to the original tariff rate, but automakers nevertheless rallied strongly. The autos indexes in Europe and the US gained +2.34% and +0.61% respectively. Anyhow EM equities also climbed on the news, with the MSCI EM index ending +0.21%. Gold (-0.12%) nudged lower while WTI Oil (+1.88%) climbed back to around$52/bbl. Credit also had a better day with US HY cash spreads finishing -6bps tighter. Meanwhile 10-yearTreasuries yields rose +2.0bps with the 2s10s curve another -1.7bps flatter and at 11.1bps is now at a new closing low for this cycle (the intraday low is still 9.7bps from last Tuesday). As for Brexit, well it was always going to be hard to top Monday for headlines, however constant speculation from various reputable sources suggesting that 48 letters had been submitted and therefore triggering a no confidence vote in PM May kept the story alive. This still hasn’t been confirmed as it requires the chairman of the 1922 Committee of backbenchers Graham Brady to officially announce that enough letters have been submitted. The BBC and ITV reported that Mr. Brady has asked to see Mrs. May after PMQs at lunchtime today which sounds ominous. However, this was subsequently contradicted by the City AM’s politics reporter on Twitter citing a source. So, still a lot of uncertainty over this. The pound quickly sold off after speculation spread to end last night -0.57% (and down -1.18% from the day’s highs) and is up +0.17% in early trade this morning. DB’s Oliver Harvey highlighted in his note ( link ) yesterday that the probability of a vote of no confidence had risen following Monday’s debacle. Oliver views this as a negative for markets. Due to a lack of internal consensus within the parliamentary Conservative Party on a future leader, a vote by the party membership on two candidates is still likely to follow, with a hard or no deal Brexit MP the probable winner. It may be possible for parliament to block a no deal outcome in these circumstances but the political process is far from straightforward. There’s plenty going on across the Channel too, where French government ministers spent much of yesterday defending President Macron’s new spending measures and tax cuts. The suggestion is that the measures could bring France’s headline deficit to 3.5% of GDP. For context, France’s government had previously expected the deficit to hit 2.8% next year versus 2.6% this year. As we know from the ongoing Italy saga the limit imposed on countries in the Eurozone is 3%. The stimulative impacts of the measures may however put the deficit in the 3-3.5% range. French assets were fairly well behaved all things considered. The CAC closed +2.35% and rose in line with other European markets while 10y OAT yields rose +1.9bps – a fairly modest move. Bunds finished-1.4bps lower at 0.23% and a new 18-month low. In other news, yesterday’s November PPI report was one for the hawks with the core reading of +0.3% mom coming in well ahead of the +0.1% expected. More importantly, the health care component printed at +0.27% mom which in turn lifted the annual rate just over three-tenths to +1.71% yoy and so unwinding some of the post-September decline. This is important as the health care component from the PPI report feeds into core PCE. So it would appear that there are now upside risks to the November PCE report. The above dovetails nicely into today’s big data highlight – the November CPI report in the US. As we go to print, the consensus for the core measure is for +0.2% mom which should be enough to nudge up the annual rate by one-tenth to +2.2% yoy. The headline – where the consensus is at 0.0% mom – should be depressed by the impact of a big move in energy prices in November. Retail automotive gas prices are down -16.6% since their recent October peak. Our US economists are forecasting an unrounded +0.22% mom core CPI reading and assuming this is close to the mark, then the annual rate would rise to +2.25% yoy, and therefore undo about half of the slide since the July post-recession peak of +2.33%. As for the other data that was out yesterday, in the UK the October unemployment rate was confirmed as holding steady at 4.1%, however there was a nice surprise for the pound with basic weekly earnings growth coming in at +3.3% yoy (vs. +3.2% expected) for the three months to October. That’s the fastest pace of wage growth in over ten years. Sterling climbed to as high as +0.60% mid-morning but gave all that up in the afternoon session seemingly as the focused turned back to the May/Brexit debacle as mentioned above. In Germany, the ZEW survey was mixed, as the current situation assessment fell around 13pts to 45.3 and the forward-looking expectations index rose 6.6pts to -17.5. Still, that’s the ninth consecutive negative print for the expectations index, which is the longest such stretch since 2008-2009. As for the day ahead, it’s fairly quiet for data this morning in Europe with only the Euro Area industrial production print for October due. This afternoon in the US it’s all eyes on the aforementioned November CPI report. Also due out is the November monthly budget statement. Away from all that we’re expecting to hear Italian PM Conte today when he speaks to Italy’s lower house of parliament. The European Parliament is also due to vote on the draft free-trade agreement between the US and Japan, German Chancellor Merkel answers questions from members of the Bundestag and the WTO general council two-day meeting begins. OPEC’s monthly oil market report is probably also worth a close watch.